I recently finished an article for Golf Course Trades Magazine called "Adjusting to the Times", see it here in their online version. I've included here the first 3rd, and will post some examples of sustainability principles in action (in addition to the ones published in the article) in the near future. We are adjusting. It’s what we do. After a recession we modify the way we do things, use resources more efficiently, turn a scarce resource into a cheaper one using new technologies, or find a new one altogether. We’ve always done it. But as we emerge from this, and possibly another recession, you can’t spin the fact that we face new realities of corporate responsibility, government accountability and real environmental degradation. There is no shortage of uncertainty out there. Golfer numbers in the US have fallen by 3.6 percent in the past three years and we are expected to lose anywhere between 1,500 to 2,000 courses to adjust to market saturation in the next ten years. Even more skepticism is raised by those facing unprecedented droughts, high energy and fuel costs without the means to purchase the more efficient technologies and government restrictions on the application of water, nutrients and pest control products. The old linear system that got us here is coming to an end. No more can we burn through resources and expect to have the same access to them as we did previously. We can’t operate as if the results of our actions don’t matter, they are catching up to us now and we must adjust by taking complete control by investing in the way that nature works, in cycles. Sustainability is not on the left or right side of the political spectrum. It is a method of doing things so that we can sustain our life on earth, and that doesn’t have a political affiliation. Environmentalism is often accused of ignoring economic realities. Sustainability is the one and only economic reality, without it, there is none. We don’t really have a choice about that. “Environmentalism” is to sustainability as what a band aid is to the cure. A single focus solution is a temporary response to a problem and is based on a system of cheap and easily accessible fuels, materials and labour. This is the difference between “sustainability” and single focused methods of making something “green”. A “green” product like biodegradable cups have a true environmental benefit to them, they are not plastic! However these cups are often thrown in the trash and cannot biodegrade because of limited oxygen and moisture (vital to the biodegrading process) when they’re buried 40 feet deep or burned in an incinerator. Yes using grown material to fabricate products is part of the transition from non-renewable to renewable resources, but they still follow the same linear system of start and end when our system is not set up to process this material. Now, if those cups were composted (they seldom are) and employed as carbon in the soil, well now we have a cycle. Recyclable materials found in cups are also part of a cycle, albeit an energy intensive one. Sustainability is a cycle of creation, of use and re-use (or recycle, refurbish, renovate, reclaim, etc), of trial and error and trying again. It’s employing natural functions of our landscapes to help support our needs. 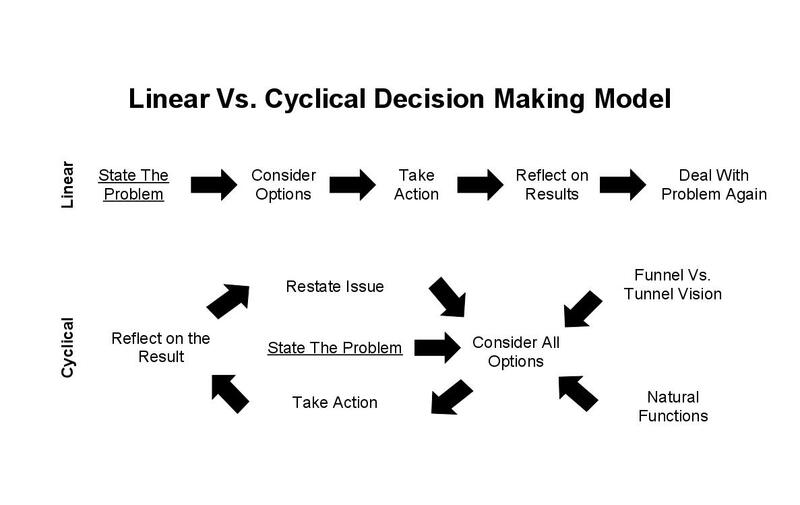 It’s moving from a linear decision making process of ending up in the same problem, to a process where we use the natural system for help. 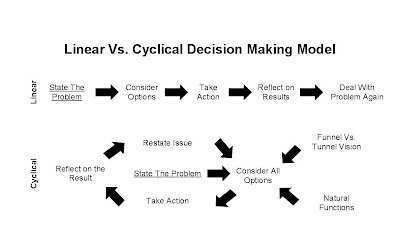 The Cyclical decision making model helps visually demonstrate this process. A Principle is external, it’s natural law and undeniable, like gravity. A Value is internal, subjective and created by social and ethical systems, like “green”. This reigns true not only when dealing with land management, but in all areas of our lives. Steven Covey in the 7 Habits of Highly Effective People wrote “values govern people's behaviour, but principles ultimately determine the consequences”. Distinguishing between the two is important because as illustrated earlier, some environmental values are highly subjective and do not necessarily serve to solve or correct a problem. If the solutions you're using are not working with these principles or natural laws, there's little you can do but loose. Very good article thanks Scott! Turfhugger delivers news briefs and analysis on sustainability issues in the golf industry.